Play drag racing game on your mobile phone. 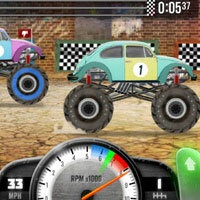 Drive a big monster truck and compete with other trucks. Shift gears at right time to accelerate faster and reach the finish as first. Earn money and upgrade the monster truck.